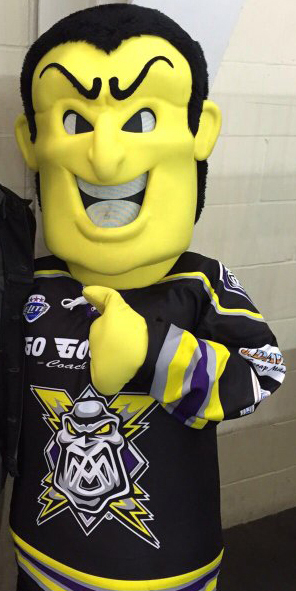 Lightning Jack is the mascot of the Manchester Storm Ice Hockey Club. 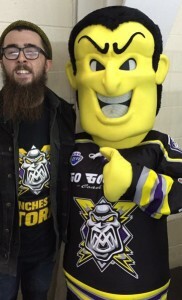 Half man, half lightning bolt, “Lightning Jack” joined the ranks of the Storm back in the clubs very first game back in 1995, at the Manchester Arena. 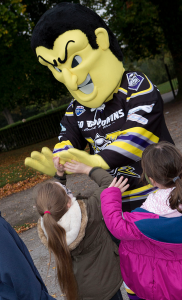 On game days, Lightning Jack has the important tasks of not only making children and adults smile, leading the chants from Block 109, but also to cause mischief in the away blocks, especially when the Sheffield Steelers are in town! 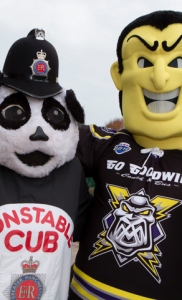 Living place : Planet Ice Altrincham. Size : Big enough to hug several fans at once. Weight : Lighter than David Simms of the Sheffield Steelers. He likes : Rain. Blocking fans’ view of the game with his head! He Dislikes : Yorkshire. Losing. 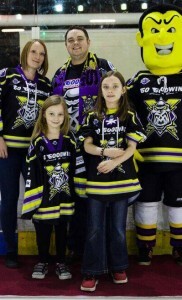 Goals : Make every man, woman & child smile @ Storm games!